Last August at Shenandoah National Park, I made the acquaintance of a fellow nature lover in the ideal social setting that is a campground bathroom. She happily told me that a bear had been skulking around the door just a few seconds before I walked in. Although bears are a common sight in this particular park, this news made me jumpy. 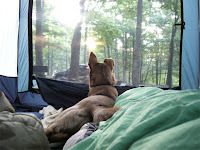 This was the first time I had taken my dog, Zoe, on a camping trip and due to a heart-stopping incident earlier in the day, I feared my idealistic vision of gleefully frolicking about the park with my canine companion was a foolish pipe dream. 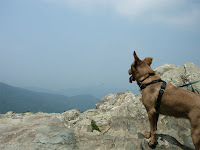 While slowly meandering up Loft Mountain on Skyline Drive, she managed to disengage the latch on her doggie seatbelt and jump out of the open car window to chase a deer. I was finally coming down from the horrible exhilaration of nearly losing my dog forever on the side of a mountain in thousands of acres of forest, hundreds of miles from home. I wasn't looking forward to a bear encounter just yet. Debbie, my fellow camper, was from Texas and loved camping in the National Parks. She was having a great time at Shenandoah but wished that there was a notable body of water nearby. I suggested she try visiting Michigan sometime. She gave me a dubious look and asked if there were any national parks there. I launched into what I now refer to as my "30-Second Outhouse Pitch", briefly promoting the two National Lakeshores along with a few State Parks as worthy of a long trip from the Lone Star State. She proceeded to advise me to lock my dog in the car overnight, believing she would attract the park's many in quisitive bears to my tent. Considering I was relying on Zoe's presence to do exactly the opposite of attracting bears to my tent (and Michigan is plenty warm 3 months out of the year, thank you very much), her company had lost its charm. I retired to my sleeping bag to spend an uneasy night languishing in the sweltering Virginia heat and keeping watch at the tent door, Zoe’s leash in one hand, flashlight in the other, swiss army knife vigilantly set at "weird hook thing". No bears came to visit. What a killjoy she was. Makes me wonder if she just made it all up. Was she hiding out in there? A few seconds ago? And she can go to Michigan when it is warm and contend with the mosquitoes and other bugs, then we would hear her complain. Cold is good in Michigan It was probably Zoe sniffing around and she thought it was a bear sniffing around and has a wild imagination. :) B. She was actually very nice, but I thought her dog advice was a bit off-base!